By Slader Matthew in Featured Content, Superintendent's Corner on March 16, 2018 . I have had several individuals comment to me about the USS Garfield County so I decided to also introduce the USS Bryce Canyon. The Bryce Canyon, aka. AD-36, belongs to the family of ships known as Destroyer Tenders. She was launched on March 7, 1946. Being a casualty for a successful win in WWII, the Bryce Canyon sat with little activity until the start of the Korean conflict. Commissioned on Sept 15, 1950, Captain MR Gerin took command and steered the vessel towards the Panama Canal for entry into the Pacific Fleet in San Diego. From San Diego, the Bryce Canyon went to Japan to service ships harbored in the Japanese ports of Yokosuka and Sasebo. AD-36 arrived in San Diego on November 18, 1951 for a 6-month port tour before heading once more to Pearl Harbor, then back to her home port. In February 1953, the Bryce Canyon again headed for Japanese waters, only to return home in 1954. During a fourth tour, AD-36 arrived in the Philippines before returning to Japan one more time. Finally returning to the US west coast, she was given the home port of Long Beach where the Bryce Canyon continued to tour the US West coast. She was decommissioned on June 30, 1981. The USS Bryce Canyon was a Shenandoah class Destroyer Tender. 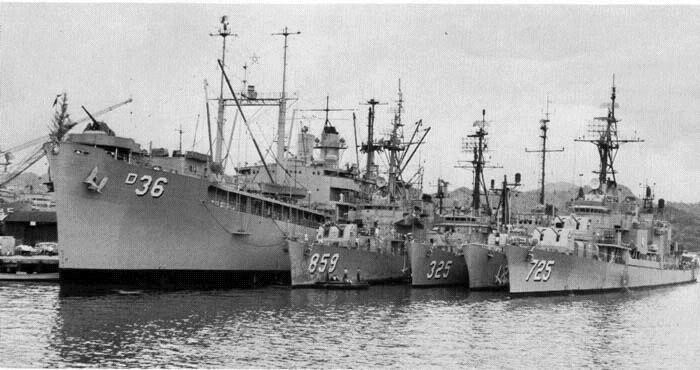 There were 6 ships completed at the end of WWII including the USS Yellowstone and the USS Grand Canyon. Four ships were canceled with the end of WWII. With a maximum speed of about 21 mph, the Bryce Canyon was about 500ft long and 70ft across. The duty of a Destroyer Tender was to provide maintenance to active warships. On any given day, 1035 crew members called the Bryce Canyon home. Due to the services she provided, the Bryce Canyon usually dwarfed those ships her crew worked on and repaired. This photo shows the Bryce Canyon servicing several US Destroyers.